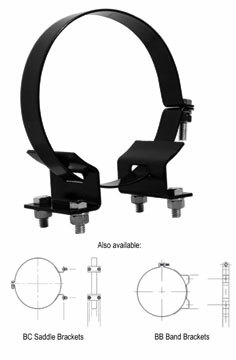 BA Saddle Brackets - Vortox Air Technology, Inc.
BA Saddle Brackets originated the Band and Saddle Bracket line. Originally designed to mount our G style oil wash air cleaners, the BA Saddle Brackets mount securely and snugly to any unit with four mounting bolts located on two adjustable legs, which offer custom fitting. Current models range from 5″-13.5″ in diameter. Customization is available upon request. Vortx Air Technology, Inc. Band and Saddle Brackets are designed to efficiently and securely hold your application in place. Built entirely with heavy gauge steel, our Band and Saddle Brackets have the ability to support any application and stand the test of time. Customers have the option of choosing Carbon steel or T304 Stainless Steel for construction material. Finishes available in painted black powder coat or polished Stainless Steel. Sizes currently offered range from 5″ to 18″. We welcome customization in band diameter and width (thickness), placement of mounting pilot holes and slots, and placement of band closure to avoid mounting difficulties due to obstructions.